Steeple Furniture – Latex Mattress Store Rockton PA.
Steeple’s Furniture Mattress Store is located in Rockton, Pennsylvania. It is the favorite furniture and flooring store in Clearfield County! In fact, its is even a whole acre filled with furniture to choose from. You will definitely be able to find the items to your liking here. In addition, Steeple’s Furniture Mattress Store is open every single day of the week. This allows you to visit the latex mattress store even if you have an extremely busy schedule. Furthermore, the furniture and mattress store also offers free local delivery to those living in the area. One of the types of furniture they offer are bedding items. More specifically, they offer latex mattresses with Vita Talalay latex inside. While Steeple’s Furniture offers several bedding brands, the only one with natural Vita Talalay latex inside is Restonic. Latex mattresses, latex mattress toppers and latex pillows with Vita Talalay latex inside offer numerous health benefits. If you are looking to upgrade your sleep experience at home, we highly recommend to test these items in the store. You will receive professional consultation and service. This way, you will find the perfect latex mattress for you or your loved ones. 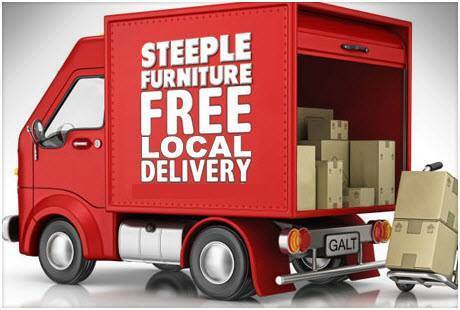 Apart from bedding items, Steeple’s Furniture and Mattress Store also offer furniture and flooring. Think of this store like a one-stop-shop for when you are looking to give your home an overhaul. Here, you will find anything from tables to lamps, as well as sofas and desks. You will also find many different types of flooring – wooden, PVC or click – whatever your heart desires! If you are looking for a store that has it all, Steeple’s Furniture and Mattress Store is definitely the place to go. And remember: there is free delivery for anyone living in the local area! Once you do, definitely give the Restonic bedding items a try – you won’t regret it!